Susan started working on the Mac Team in January 1983. 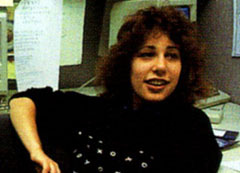 She designed most of the icons and fonts for the Macintosh, as well as lots of the original marketing material, and helped to craft the overall look and personality of the system. After leaving Apple in 1985, she was one of the first ten NeXT employees. Since 1988, she has been a successful independent graphic designer.